 Rabbit anti Mouse Interleukin-3 antibody recognizes mouse Interleukin-3 (IL-3).Rabbit anti Mouse Interleukin-3 antibody neutralizes murine IL-3 activity with an ND50 for mIL-3 (0.5ngml-1 of between 0.15 and 0.2μg ml-1. Reconstitute with 1.0 ml sterile PBS containing 0.1% Bovine Serum Albumin. Care should be taken during reconstitution as the protein may appear as a film at the bottom of the vial. Bio-Rad recommend that the vial is gently mixed after reconstitution. The addition of 0.09% sodium azide is recommended for long term storage. Antisera to murine interleukin 3 were raised by repeated immunisation of rabbits with highly purified antigen. Purified IgG was prepared by antigen affinity chromatography. Highly purified recombinant murine IL-3. Prior to reconstitution store at +4oC. Following reconstitution store at -20oC.